As I have noted before, the heathen people of the Viking Age had a number of burial practices, from assembling ship-shaped cremation rings to building elaborate burial cairns, yet the most beautiful and enigmatic of their graves are usually concealed beneath the ground, graves in which men or women have been sent on their final journey in Viking ships. If someone were distinguished enough, their burial ship would also contain numerous gifts to bring with them to the afterlife, such as weapons, jewelry, horses and perhaps even slaves. After shooting in Greenland, I have traveled to Vestfold, Norway, where the most impressive burial ships have been excavated. I first learned about these at the Viking Ship Museum in Oslo but have returned to visit the sites from which these large oak timbered ships and their artifacts have been unearthed. One unique example is the Oseberghaugen, the mound in which the remains of two Viking age women were found, along with the skeletons of twelve horses, a large wagon and an abundance of other valuables. One can only imagine the process of filling a 21 meter-long ship with these bodies and treasures, burying it in the ground and filling it over with earth. The Oseberg mound (left) and the Gokstad mound (right). The ship buried in the Gokstad mound measured 23 meters long and 5 meters wide. Once the Viking Age had ended (after the mass conversion to Christianity) these burial practices were forgotten about and the mounds would simply appear to be random hills in the landscape, until 19th century farmers curiously investigated by digging into them a little and contacting the authorities upon their astounding discoveries. The presence of such large or extensive ship burials in Vestfold has astounded historians who are keen to link sites such at the Børre Mound Cemetery to the legendary Yngling dynasty of 9th Century Norway. Luckily, from my perspective, so many of the mounds remain unexcavated – their secrets protected with their precious contents. The Børre Mound Cemetery is now a National Park where you can stroll around and explore seven exceptionally large mounds and some cairns. Photographing these sites where there is not much left to see other than a perfectly mowed knoll set in the ‘middle of nowhere’ may seem a bit absurd, however the grave site called Bikjholberget at the Viking Age town of Kaupang provides inspiring visuals. In 1950, the excavation of a relatively small area revealed numerous small boat graves, most likely containing common people, in a wonderfully haphazard arrangement. 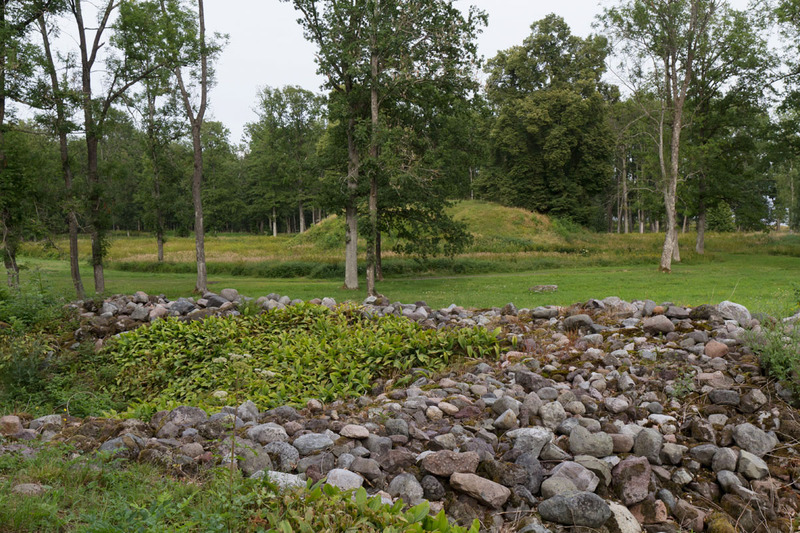 Even so, at Kaupang and at any other of the mounds, one is left to use their imagination to fill in the blanks. The schematic on the left shows what the excavations at Kaupang revealed. The photo on the right features the small boat grave from the centre of the schematic. 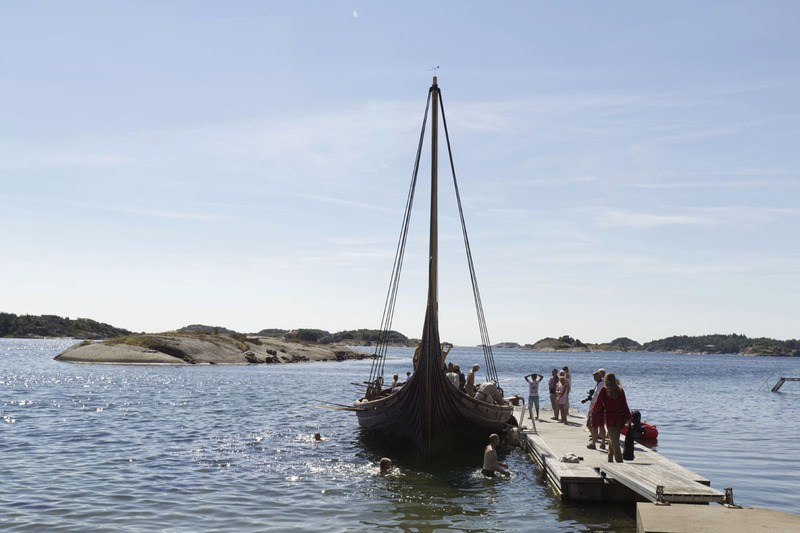 A fortunate coincidence: while I was visiting Kaupang, a replica of the Oseberg Ship stopped in at the harbour after participating in a Viking Ship ‘competition’ at Risør.